Typically wireless charging technology in cars are positioned as a way to simplify recharging electric car battery packs. 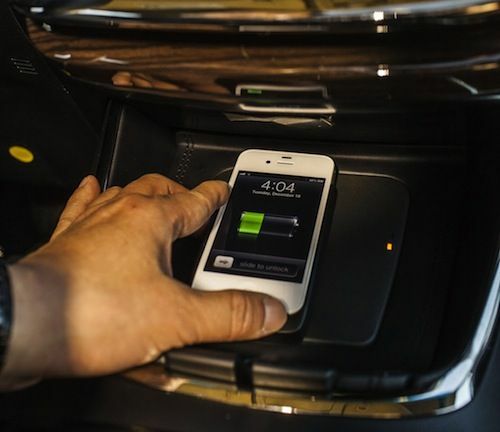 At the Mobile World Congress in Barcelona this week, the Wireless Power Consortium has announced a new automaker has adopted its Qi wireless charging solution, for mobile devices. The automaker, Ssangyong, will adopt the Qi wireless charging system in future cars built by that Korean automaker. The Wireless Power Consortium is an open membership consortium promoting Qi, the global wireless power standard. The consortium says "Qi is the only wireless power solution directly integrated into flagship smartphones and automobiles, a demonstration of overwhelming industry support and recognition of Qi’s versatility." The WPC's first automotive partner, Toyota, is showing the 2013 Toyota Avalon interior console with integrated wireless charging made by Philips Lite-On Digital Solutions (PLDS). Ssangyong is showing a Qi system designed by Leggett & Platt. The automotive market is often slow to adopt new technologies, and for the Qi system to so rapidly be embraced by two automakers validates the claim of "overwhelming industry support." The Qi system uses inductive charging to transfer power from a pad to a device resting on the pad. While people can buy charging pads, the system is increasingly being integrated into every-day products like furniture or, even, cars. There are now 36 different Qi-integrated or Qi-ready devices, according to the WPC. The consortium has nearly 200 member companies. At the Mobile World Congress the WPC is also demonstrating a fast charging system for mobile devices, which is the world’s first Qi 7.5 watt fast-charging solution by ConvenientPower to deliver battery charging in two-thirds of the time normally required.